Like other meaningful artists who came before her, N’Dambi is felt before she is heard. Gifted with a raw, resonant contralto and a presence that’s both sultry and self-possessed, the Dallas, Texas native is a performer who can reflect a given mood as well as she can create one. Although early in her career she was a background singer for her more flamboyant peer, Erykah Badu, N’Dambi was always carving her own niche as a purveyor of home-grown, funk-fringed, yet eclectic soul. After a handful of independently-distributed sets, N’Dambi joined forces with music veteran Leon Sylvers in 2009 and released Pink Elephant, a galvanizing Grammy-award-nominated album that added modernized urban sheen to her uniquely earthy style. With such a high-profile and hit-generating release, N’Dambi’s subsequent near-absence from music was just as affecting as her presence, so fans should find relief in her collaboration EP with the band All Cows Eat Grass, Air Castle. Regarding the lengthy hiatus, N’Dambi only recently expressed, through a Facebook post, that she had been experiencing “major shifts” in life and needed new inspiration---and perhaps a sort of wingman---to help lay a template for the musical messages she wanted to express. From the handful of tracks that transpired, there was definitely a synergy created between the pair, adding a futuristic, yet ethereal twist to N’Dambi’s delivery in “Nowhere” and levity to the pathos-heavy “Just a Man,” a mid-tempo muse about how her relationship expectations, good or bad, all lead back to what Dad did….or didn’t. But don’t take ‘frothy at the surface’ to mean ‘empty in the middle’: “Show Me Your Smile,” for example, is lilting and flirtatious, and the centerpiece title track evokes the heady, vocally layered double-entendres from the 70s that turned the ordinary into doorways of whimsy. As she sings of "magic chandeliers" and air castles up above, her contralto becomes meditative and mezmerizing. Perhaps that "hurt, isolation and pain" N'Dambi spoke of encountering needed the salve that this groove provided, especially since she reminds us as the EP ends that no matter where we are in the journey, all of us are on "Borrowed Time": "....one day, we'll leave it all behind," she intones with the sass and sage of an elder. "So live like the future's begun." It was the late, great writer, Gloria Naylor, who once said that, "only fools go around trying to talk about their love or their pain. So the smart people make music and you can kinda hear about it without them saying anything." So N'Dambi and All Cows accomplished just that, sharing illuminating glimpses into their cathartic process by way of groove and song. Will N'Dambi share more of what her journey entailed? That remains to be seen...or heard. 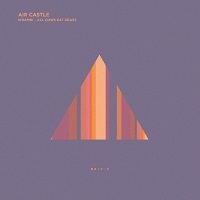 But that doesn't make Air Castles any less enjoyable to explore . Highly Recommended.